In January 1918, the U.S.S. General Pershing was launched into Budd Inlet. The more than 250 foot “auxiliary schooner” was put to sea from the Sloan Shipyard just after dawn with 500 early risers watching as she slipped into the water. 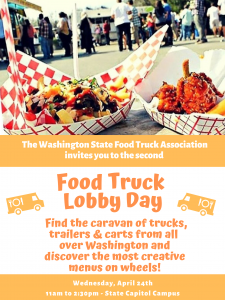 But, like much of the history of the Sloan Shipyard in Olympia during the course of World War I, a lot was left to chance and the wooden ship quickly hit a mud flat on the opposite shore. A tugboat that was supposed to catch the ship after it slid into the water didn’t do its job and the Pershing slipped straight across Budd Inlet into the mud, where it stayed until the tide came up enough for it to float away. Like the Pershing’s launch, bad planning and lack of foresight would also doom the Sloan Shipyard. 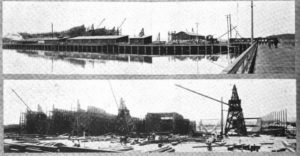 The Sloan Shipyard was established in March 1917 at the end of Washington Street near where the port cranes are now and began construction on its first wooden vessel quickly. The United States was still a month away from declaring war on Germany, but the need for a commercial fleet to ferry supplies to the potential American forces in Europe was obvious. 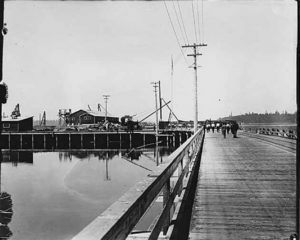 The Sloan Shipyard was built just south of an existing shipyard on the Olympia waterfront and began construction of what were called Ferris type ships. Despite the trend to begin building steel-hulled ships, shipyard owner Phillip D. Sloan boasted that wooden ships were still more cost efficient. And, of course, wood was plentiful in the Pacific Northwest. In addition to being made out of wood, these so-called auxiliary schooners were deemed so because they were still primarily driven by sail. Their steam engines were only considered “auxiliary” power. Phillip Sloan was one of four brothers born in the Midwest and schooled in the inland Great Lakes freshwater shipbuilding tradition. He and his brother Joseph would eventually come west and begin building ships on the Puget Sound. At the outset of the war, they set their eyes on government contracts. Both the Olympia Shipbuilding Company and the Sloan Shipyard did brisk trade during the war years. At their height, more than 1,000 men turned more than 1.5 million board feet into just less than a dozen ships for the war. Hundreds of men were employed as the shipyard ramped up operations. The culture of the shipyard quickly infiltrated Olympia society as most newspaper mentions of the shipyard in those early months as the end of World War I was not in site included social listings for managers and the exploits of the shipyard’s bowling, basketball, baseball, and boxing teams. Labor strife would be the first clue that not all was well at the Sloan Shipyard. At various points throughout its short history on the Olympia waterfront, teams of labor organizers and management haggled over wages. And, finally, in November 1917 (less than a year after the announcement of the shipyard), it was closed because of a strike. That strike was apparently the last straw in a long-simmering dispute that had been kept out of the public’s eye until late 1917. Frustrated by the lack of delivery of ships (only 3 of 17 built by the end of the year), the federal government stepped in to take control of the Sloan shipyard, kicking Phillip Sloan out of his position as manager. Government management of the shipyard also wouldn’t keep labor disputes at bay since the shipyard again closed down in February 1919. At the announcement of the new shipyard in January 1917, there was a promise of at least five years of work – but the end of World War I meant the death of the Sloan Shipyard and the exposure of slipshod record keeping and business practices. There had already been rumors that in the spring of 1917, Phillip and Joseph Sloan had taken a $1.7 million payment from the federal government for 16 ships to be built in Olympia, but that they had spent the majority of the money paying bribes and buying expensive equipment for the shipyard. Congress later uncovered that the company had used the money for setting up of the initial Olympia shipyard instead, as the contract stipulated, just on building ships. But it was the way that the federal government, through a special corporation it had set up to quickly build ships for the war effort, took control of Sloan Shipyard that would become a lasting debate. The Emergency Fleet Corporation took control in the winter of 1917/18 because ships were not being built quickly enough, but as the Sloans started auctioning off their properties at the end of the war in the financial rubble of lost contracts, they filed suit. They based their suit not on the merits of the takeover, but that the federal corporation didn’t have the authority to do so. Four years later, the U.S. Supreme Court, in a decision covering a handful of other shipbuilders in the same boat, sided with the Sloan family, saying they could take the federal government to court over lost payments. That victory didn’t come fast enough for Joseph Sloan, Phillip’s older brother and partner in the shipyard. Essentially ruined by the demise of their shipyard, Joseph also suffered from asthma. He shot himself in Seattle as his brother Phillip began the fight again through lower courts to bring economic justice to the family. These efforts also failed, but not before he spent the next year fighting through various avenues of federal court. The federal government eventually cut off Phillip’s last effort in 1924, and the entire family’s properties were split up between various debt holders and local governments for back taxes.